Acrylic glass is translucent, UV resistant, conditionally resistant to breakage and is immune even to intense heat or cold. Acrylic glass is ideal for use both indoors and in outdoor area. 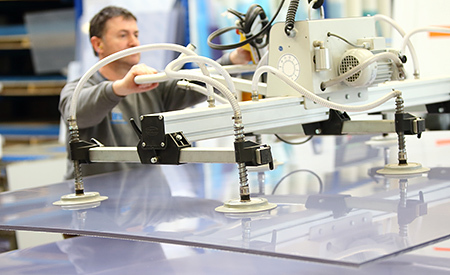 The uses of Acrylic glass are extremely varied, as are the individual processing steps we take with our 20 years of experience in the field. In fact, it's the plastic processing that we carry out which makes us an experienced, reliable and powerful partner for industry. We support our customers from the word go. Whether it be selecting the appropriate starting material, or adjusting the products to meet the purpose. We process Acrylic glass from A to Z, until the finished product has emerged, while you benefit from the many possibilities of our production. Every product that leaves our company meets the highest requirements for quality and durability. The material properties of plastics are ideal in perfectly meeting customer-specific requirements. Its lightness, transparency brilliance and colourfulness allow creative and tailor-made solutions. Due to the daily innovative ideas of our customers, we employ creative new ways of working. Through this, the possibilities of cutting and processing plastics are almost endless. We only use products from leading manufacturers, whose quality awareness enables us to provide our customers with products of only the highest quality.